TPC Overall Rank: #29 out of 2933 rides. In User Top 10: 550 times. User Tracker Count: 574 times. A brilliant thrill and a very easy coaster for beginners who are maybe afraid of the slow climb that many coasters go through. I talked my partner on to it and they absolutely LOVED it and wanted to go again!! I did not like this ride at all. The first hill was really fuun beacause you were shot up really fast. But after that, it was so rough and boring. This was my favorite ride at the park. The initial launch and zero-g roll are certainly the best part of the ride. Suprisingly, the cobra roll was not at all disorienting. Although it looks as if the ride is not all that fast when you're observing it, it certainly feels very fast while you're on it. I thought the pacing was very good throughout the ride and the turns provided some strong g's. I didn't notice all that much headbanging. Certainly a must-ride for anyone who goes to IOA. 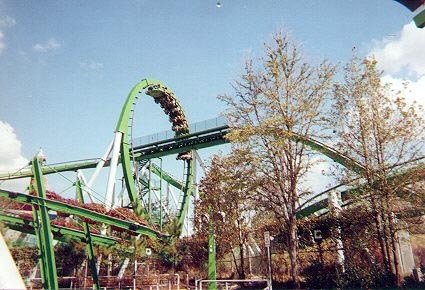 The Hulk, B&M&#39.s only lanuching coaster. One of my favorite coasters. This ride sarts out with a 2-40 MPH into a zero-g-roll before the intial drop. The launch is farily good the Zero-g-roll is the best part of the ride. This ride then throws you at 67 MPH through the world&#39.s biggest cobra roll. The ride then enters a large loop then goes under a mist filled bridge. The ride exits the bridge and goes up into two overbanked curves. The frist corkscrew then comes after the curves. The ride exits the corkscrew then goes down into a loop and that loop goes over the mid course brake. After the loop the ride slams you into a hard banked turn then you enter the midcourse brake. On the drop after the brakes you get a nice little pop of floater air then into the final inversion the 2nd corkscrew. The ride then goes throgh a hard banked curve and then into antoher ground hugging curve in which your picture is taken. The ride then enters the final brakes. A slow speed curve is taken after the frist set of brakes. You then enter the Launching/Loading tunnel. This is a High speed ride from the launch to the final brakes. There is a loud roaring soud this ride makes that can be heard throught the park. Ah, the Hulk. 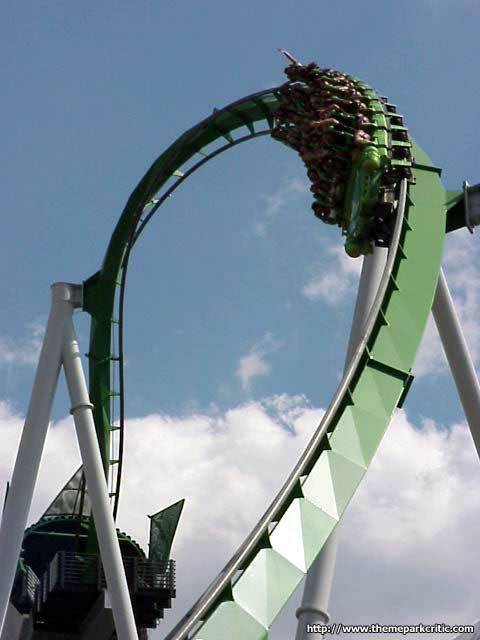 This aptly named B and M green, scream machine epitomizes what the Hulk is- a gigantic mass of power and fury. In some ways, this bodes well for the park’s iconic attraction, but in other aspects, the Hulk’s fury is unleashed on riders in the case of a nasty case of B and M headbanging. Well the ride itself is very picturesque and worthy of the distinction as the park’s iconic attraction. At the surface all of the monstrous elements such as the gamma tube and it’s location over the lagoon look incredible, but the ride does look in need of a fresh coat of paint, especially in the mist-filled tunnels since the once green track is now a dark shade of black. As I made my way through Bruce Banner’s lab (queue), I was treated to classic clips of the Hulk animated series. During my visit, I only encountered lines around 15-20 minutes long, which is certainly worth waiting. Unfortunately other than the option of waiting for the very front seat, Universal assigned me seats. I tried the front once since it had no wait since the ride had just reopened following a viscous downpour, but I can say unless the view is absolutely important, just wait in the normal line since all seats gave me an identical ride. Well the ride’s premise is Bruce finally devising an invention to rid himself of “the beast within.” In fact, Bruce permits us to take part in his experiment. Well, as expected something goes horribly wrong (horribly wrong for him but good for riders). 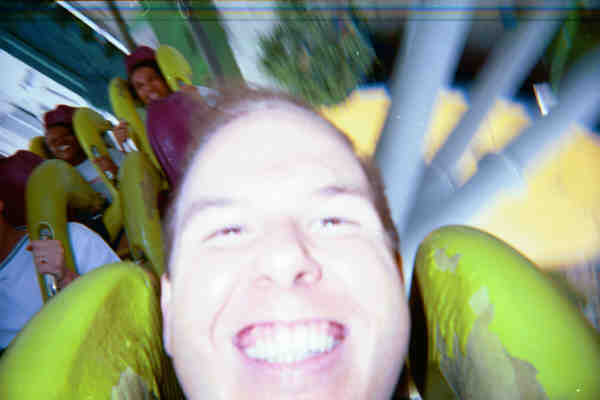 Much to the chagrin of Bruce, he transforms into the green monstrosity known as the Hulk and instantaneously, riders are launched out of the gamma tube and experience the best zero-G roll on the planet. I was absolutely blown away by the ride’s beginning, which combined an incredibly abrupt and the most powerful launch I’ve ever experienced with a glorious zero-G roll that gave an incredible moment of hang-time some hundred feet off the ground. Well such an act would certainly be difficult to follow, which unfortunately was the case for the Hulk. At the bottom of the zero-G roll, immediately before the cobra roll, there was some slight headbanging, something that arose far too often on this coaster for my taste. Well the following cobra roll was enormous, it just wasn’t very good. Just like the one on Dueling Dragons, it just seemed forceless and at the very bottom of it there was a little headbanging just like the moment that preceded the very same element. The following vertical loop was pretty good though, but at the bottom was the worst moment of headbanging on the entire ride and it was bad, really bad. It was just about as bad as the typical headbanging found in an Arrow corkscrew element, not a good sign. Next came a gigantic but smooth turnaround followed by a great corkscrew that really provided some powerful Gs. Immediately after came the second vertical loop, much smaller than the first, but personally better thanks to the added intensity due to the smaller size. It’s a perfect case where bigger isn’t always better. Then came a turn and a very sudden a good swooping drop that was deceptively steep and forceful, as it combined moderate laterals with some good air time. After a quick turn and a brief brake run, the Hulk dives into the finale giving back-seat riders a rapid moment of floater air- a very nice surprise for me. 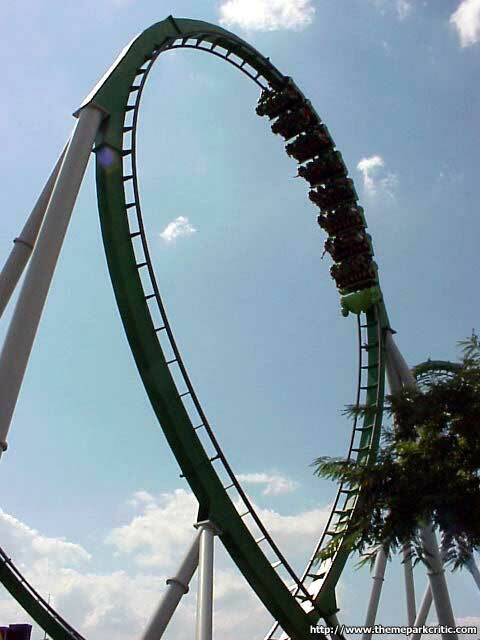 But without giving me a moment to catch my breath, the Hulk thunders into a pretty forceful corkscrew. Last but not least is the final helix which has some powerful Gs for sure, but it’s unfortunately got some headbanging that hampered my enjoyment of the element. So what’s my final opinion on this ride? It’s definitely one of the most forceful coasters I’ve been on, especially for a B and M, but the headbanging definitely hampers this coaster from being a truly great ride. While uncomfortable, the headbanging didn’t result in a headache after riding. It just ruined my riding experience a bit. 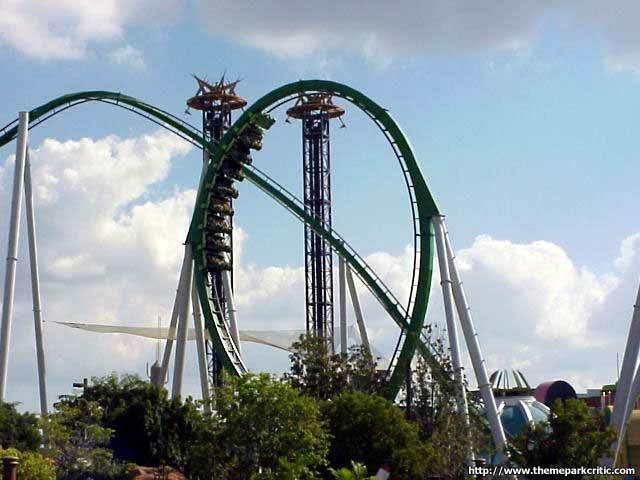 I like both Dueling Dragons better than the Hulk since they provided an almost identical level of intensity all while being smooth, but the Hulk’s brute intensity (especially the incredible beginning) definitely makes the Hulk one of the park’s best attractions and best coasters around. I have ridden many coasters and although scared to death of heights I LOVE roller coasters. There hasn&#39.t been a coaster yet that absolutely scared the daylights out of me. I wouldn&#39.t say I was scared to death, but when they shot you out I grabbed on for dear life! Definitely an awesome coaster! We got there when the park first opened so we got to ride 4 times with no wait before the queue was up to an hour and we were done. Date Ridden: January of 2007 and 2008. Times Ridden: 5 with once in the front, once in the back, and three times toward the middle/back portion of the train. With the release of the new Hulk movie this Friday, I think it fitting to give this ride its review. Living here in the Peach State of Georgia, coaster season closes in late October and starts back up in May. However, thanks to Orlando, I can get my coaster fix on each MLK weekend with a trip down to sunny Florida. I wont mention the humidity and spoil if for you. 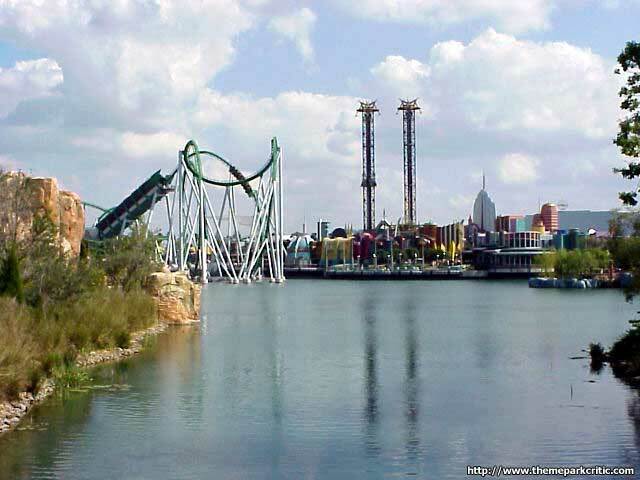 IOA is one of our destinations each year with Hulk being the first ride we normally jump on in cartoon oriented Super-Hero Land. 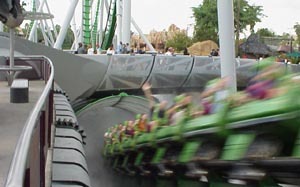 I, like most other enthusiasts, feel that B and M hit one of the park with the creation of this green machine. However, I may be able to defend this ride from a different view point......that of the B and M computer geek designer. Read on as I sneak a peek inside his head....... Computer Geek thinking aloud... "Ok, the Hulk is this gigantic green monster that is really intense. He jumps high, is strong, and can run really fast. But wait a minute....to start with he is this wormy-looking little geek scientist (hmmmm.....me?) until he gets angry. 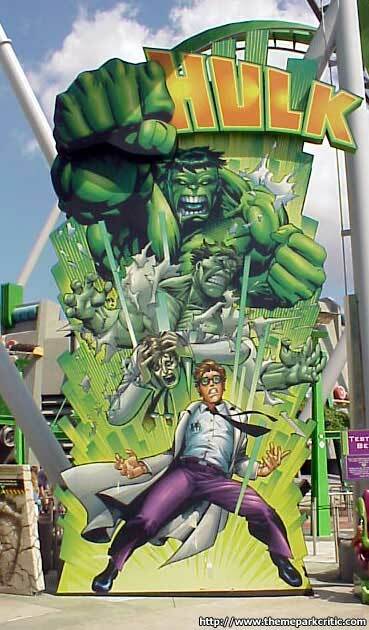 So, the ride should start off slow and then just go berserk when the geeky white dude turns big and green. Can we do that? Yep, we just need some tires and a propulsion system that shuts down half the power in Orlando when it launches." Coaster Designer Geek continues to think...."OK, the insane launch out of the tunnel into the inversion....the dive into the mist....and the huge cobra roll. All that seems to be symbolic (I read my Poe in high school: And the Red Death held illimiatable dominion overall, even the 12 year old cousin I married) of the Hulks anger. Now, what happens after he gets mad? Why, he calms down of course! So after the mid-course brakes we can design this ride as a snooze-fest symbolizing the return of the giant green guy into the geeky scientist once again. "End of Coaster Designer Geeks thoughts. In all seriousness, I like Hulk and give it a solid 9. It is a gorgeous attraction that is visible from anywhere in the park. I personally like the back of the train a little better since it seems the launch is longer so I would recommend riding there if possible. Also, the technology used for the launch still amazes me. I cant help but think of all those rotating Goodyears beneath the track each time I ride. 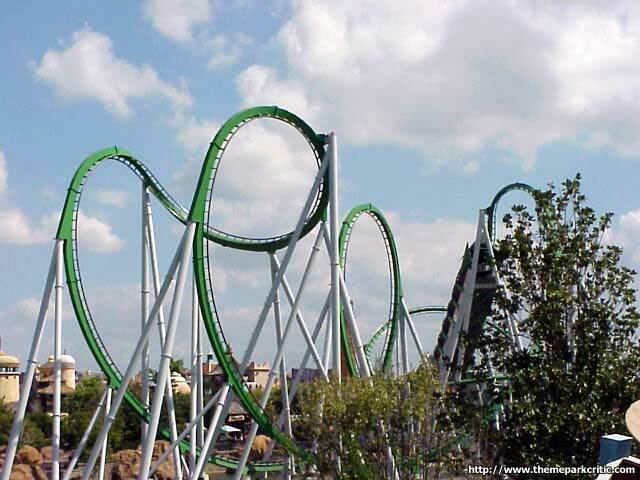 In summary, Hulk is a great coaster worthy of its top 20 ranking in many steel coaster polls. I personally like the Dueling Dragons better, but IOA does indeed have a solid trio of 9s making it a coaster lovers paradise. I will admit that the beginning of the ride was fantastic. The launch into the barrel roll is brilliant...by far the highlight of the ride. 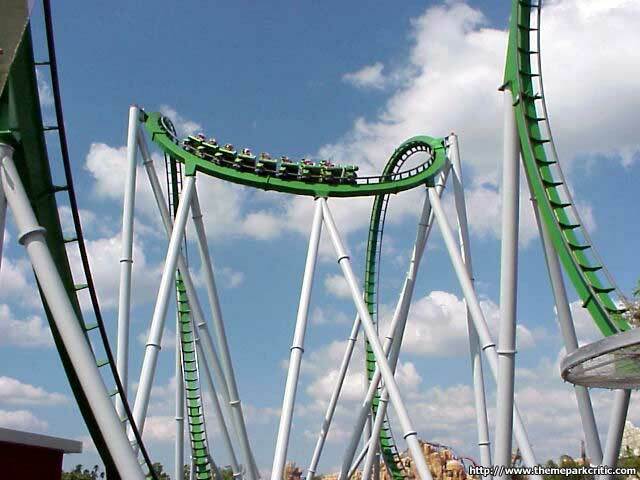 Not many coasters have such an epic initial 40 seconds, but Hulk can definitely lay claim to one. However, after you pull out of that harrowing first drop, the ride settles into an uninspired series of monotonous inversions that really just didnt do anything for me. Whats more, the ride has not aged well, if you ask me. During my visit, the track was in desperate need of a repaint in select areas, especially those cloaked in thick mist, and the ride overall had a lot of rattle to it. Its a fun ride...that much is sure...but considering the way so many people hype this ride, I was expecting more out of it. Regardless, the first 40 seconds is Hulks redeeming quality and it should also be noted that the ride provides decent forces in its elements on the whole.